Click a date above to register, or visit our shop here, scroll down to events, choose a date, the link will take you to registration and secure square payment checkout. Our 2017 season is winding down and we have begun filling the drying shed with lavender and herbs. We are now open by appointment only, you are welcome to call 303-514-6504. Thank you to everyone who came out to visit the greenhouse and gardens, purchase our products and share our love of lavender. We will busy ourselves with more weeding, cutting other flowers & herbs, distillation, product making and ideas for next season. It’s Bloomn’ Time at Heritage Lavender! 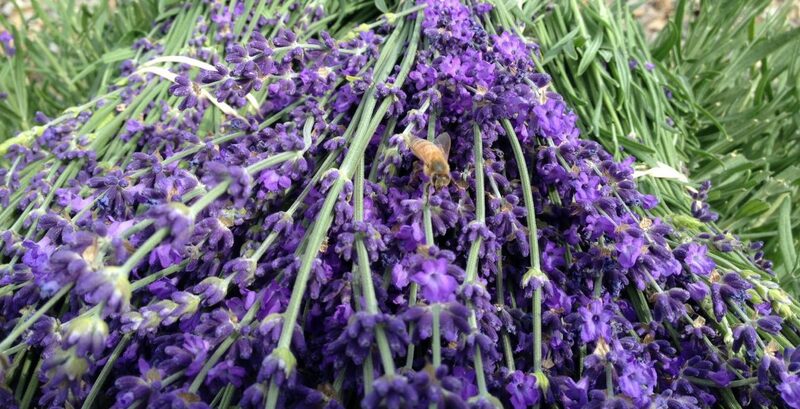 Stop by to see the blooming lavender, 10am – 4pm this Friday & Saturday July 7th or 8th, We will be open to the public and have lavender products and culinary delights for purchase. Spring in Colorado ~ Tuesday Mow the Grass, Wednesday Shovel Snow! Last week a late spring storm brought rain and snow creating our own snowy range on the North side of the greenhouse. Thankfully, we were fortunate to escape tree damage AND the 36 inches that accumulated just 30 miles west of us. We will be kicking off our growing season with a plant sale this Friday and Saturday, May 26th & 27th, so stop on by if you need replacement plants or a new lavender plant for that spot in your yard that gets full sun. Our greenhouse is only 20 feet wide and 32 feet long, but we have it filled to the brim with plants of all sorts. To fill some of my boring winter days I played around with propagation techniques, seeds and plugs from wholesale growers creating a mish-mash of plant offerings. The lavender varieties offered this year are Lavendula angustifolias (English varieties) of Munstead, Hidcote, Folgate, Buena Vista, Ellagance Purple & White. The less hardy lavandin, Provence and Grosso do well as annuals, in a pot or overwintered protecting the plant like you would a rose bush . In addition we will also have tomato plants, hanging baskets, succulents, geranium, daisies, verbena, Ipomoea. Of course we will have $1 annual plants in 2 inch pots, perfect for filling pots or spots in the flower beds. The herb line up is Rosemary, Tarragon, Thyme, Sage, Basil, and mint. We have lots of Pineapple sage and some yummy Strawberry Mint, both are great to muddle with a little sugar and add to your favorite drink or sparkling water. The lavender plants in the gardens have had their spring hair cuts and are beginning to green up. We anticipate the bloom time to be early to mid July. This year we will be open to visitors 10am-4pm, Thursdays, Fridays and most Saturdays in June and July, closing after harvest is complete in late July. Watch our website event page and Facebook for announcements regarding the summer markets we will attend. Make sure you take time out for a little “you” time and a relaxing deep breath of lavender. We look forward to seeing you this summer!